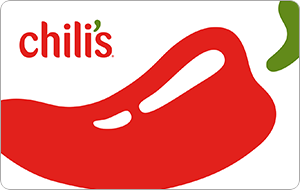 Whether you want to connect with friends and family or just don’t feel like cooking, head to Chili’s Grill & Bar for our sizzlin’ service, laid-back atmosphere and a taste of our spiced-up Southwestern favorites like our famous Grilled Baby Back Ribs, our juicy Big Mouth Burgers® or our tender marinated fajitas. More Life Happens Here. Brinker International and all of its affiliated brands, including Chili’s® Grill & Bar, Maggiano’s Little Italy®, and On The Border Mexican Grill & Cantina® are not a sponsor or co-sponsor of this promotion and is not liable for any alleged or actual claims related to this offer. See back of card for terms and conditions. All brand names and logos are registered trademarks of their respective owners.